Relatively high concentrations of toxic metals such as Cr and Pb in dissolved ...... dust events on airborne bacterial community assessed by molecular analyses. less forms that are suitable for penetration, trans- portation and ... Worldwide, the mercury levels in fish exceed now the ...... Geochemical Atlas of Finland II. Geo-. Abstract Industrial waste water and sediment containing heavy metals causes many ecological and health related problems. Many conventional methods were already being used to decontaminate the environment from adverse effect of these pollutants but yet most of the methods used are very expensive and far away from their best possible performance. The capability of microorganisms to bind metal ions is a well-known trend. Different experimental data are documented and presented for different metals and biomass types. In this review a brief overview of the potential of biosorbents and biosorption processes were critically reviewed. This briefly describes biosorption process and some of the analysis of different low-cost biosorbents used for heavy metal remediation from waste stream. Keywords: Microbes; Potential; Heavy metals; Biosorption Introduction Heavy metal pollution has become one of the major environmental problems that pose serious health hazard . Different type industries use different type of heavy metals and directly or indirectly discharge wastewater containing toxic substances into the environment . Trace amounts of heavy metals are required by living organism including copper, iron, zinc but however excessive levels of these metals can be toxic to the organism due to their toxicity and accumulation behavior . Different methods have being used to decontaminate the environment from adverse effect of these pollutants but yet most of the methods used are not cost effective and far away from their best possible performance . Consequently the need to replace with biological method with are cheap and efficient method of treating metal-bearing effluents as these method may provide a possible way out to metal removal from contaminated environment . Sources of Heavy Metals The world anthropogenic emissions are larger than or equivalent to natural emissions for the majority of trace metals  the metals ions coming from anthropogenic sources may be accumulated in aquatic organisms and transfer to humans through the food web. Consequently, human health risks may occur because water organism contaminated by heavy metals can cause many health related problems [7,8]. study the biosorption for heavy metal removal which involved the use of either laboratory-grown microorganism or biomass generated by different processing industries or wastewater treatment units [12,13]. *Corresponding author: Mohammed Umar Mustapha, Desert Research Monitoring and Control Centre, Yobe State University, Damaturu, Nigeria, Tel: +234 (803) 625 0046; E-mail: [email protected] Received July 31, 2015; Accepted August 13, 2015; Published August 20, 2015 Citation: Mustapha MU, Halimoon N (2015) Microorganisms and Biosorption of Heavy Metals in the Environment: A Review Paper. J Microb Biochem Technol 7: 253-256. doi:10.4172/1948-5948.1000219 Copyright: © 2015 Mustapha MU, et al. This is an open-access article distributed under the terms of the Creative Commons Attribution License, which permits unrestricted use, distribution, and reproduction in any medium, provided the original author and source are credited. [24,25]. This type of biosorption, i.e., non-metabolism dependent is relatively rapid and can be reversible as explain in details in Figure 1. These detoxifying mechanisms of bacterial can be categories into: i.
ii. Export keeping the toxic ion out of cell by altering a membrane transport system involved in initial cellular accumulation. iii. iv. Extracellular sequestration by specific mineral-ion binding. Extracellular detoxification of the toxic cations or anions by enzymatic conversion from a more toxic to a less toxic form (Tables 1-4). Bacteria as Biosorbents of Heavy Metals Bacterial biosorption is mainly used for the removal of pollutants from effluents contaminated with pollutants that are not biodegradable, like metals ions and dyes. However, their isolation, screening and harvesting on a larger scale may be complicated but still remain one of the efficient way of remediating pollutants. Different bacterial strains were used for the removal of different metal ions. Table 1 below shows the biosorption capacity of different metal ions by different bacterial biomass. Bacteria have evolved a number of efficient systems for detoxifying metals ions they develop these resistance mechanisms mostly for their survival. Algae as Biosorbents of Heavy Metals Algae are efficient and cheap biosorbents as the requirement of nutrient by algae is little. Based on statistical analysis on algae potentiality in biosorption, it has been reported that algae absorb about 15.3% - 84.6% which is higher as compared to other microbial biosorbents. In all the type of algae brown algae was known to have high absorption capacity. Biosorption of metal ions occurs on the cell surface by means of ion exchange method. Brown marine algae has the capacity to absorbed metals like Cd, Ni, Pb through chemical groups on their surface such as carboxyl, Sulfonate, amino, as well as sulfhydryl. Fungi as Biosorbents of Heavy Metals The use of fungi as bio sorbents material has been shown to be efficient material is also one of the cost-effective and eco-friendly methods with serves as an alternative to chemically bound treatment process. The capability of the many type of fungi to produce extracellular enzymes for the assimilation of complex carbohydrates for former hydrolysis makes capable the degradation of various degrees of pollutants. They also have the benefit of being relatively uncomplicated to grow in fermenters, therefore being appropriate for large scale production. Another benefit is the easy separation of fungal biomass by filtration because of its filamentous structure. In comparison to yeasts, filamentous fungi are less sensitive to variations in nutrients, aeration, pH, temperature and have a lower nucleic content in the biomass [26,27]. Complexation Figure 1: Mechanisms of biosorption based on location of where metal removed are found . Metal smelting and refining, phosphate fertilizers, Paint pigments, pesticides, plastics, polyvinyl and copper refineries. Metal refining, galvanization, paint and powder, batteries processing units, and super phosphate fertilizers. Rubber industries, paints, dyes, wood preservatives and ointments. From metal refining, galvanization engine parts. Semiconductors, petroleum refining, wood preservatives, animal feed additives, coal power plants Automobile exhaust, industrial dust and dyes. Table 1: Some of the common industrial units releasing toxic heavy metals into environment are listed below . 2. Glombitza F, Reichel S (2014) Metal-containing residues from industry and in the environment: Geobiotechnological urban mining. Adv Biochem Eng Biotechnol 141: 49-107. 3. Franke S, Grass G, Rensing C, Nies DH (2003) Molecular analysis of the copper-transporting efflux system CusCFBA of Escherichia coli. J Bacteriol 185: 3804-3812. Table 4: Fungal species used and their biosorption capacity. Conclusion Microbial biomass is one of the low-cost and efficient biosorbents of heavy metals removal from solutions. The process of biosorption has many attractive features including removal of metals ion over relatively broad range of pH and temperature. Many researchers studied biosorption performance of different microbial biosorbents which provide decent arguments for the implementation of biosorption technologies for heavy metal removal from solutions and also to understand the mechanism responsible for biosorption. Consequently, through unrelenting effort and research, above all full-scale on pilot and biosorption process, the situation is expected to change in the near future, with biosorption technology becoming more beneficial and eyecatching than currently used physicochemical technologies of heavy metal removal. References 1. Aktan Y, Tan S, Icgen B (2013) Characterization of lead-resistant river isolate Enterococcus faecalis and assessment of its multiple metal and antibiotic resistance. Environ Monit Assess 185: 5285-5293. 4. Zabochnicka-ÅšwiÄ tek M, Krzywonos M (2014) Potentials of Biosorption and Bioaccumulation Processes for Heavy Metal Removal. Mercury 6: 145. 5. Pandit R, Patel B, Kunjadia P, Nagee A (2013) Isolation, characterization and molecular identification of heavy metal resistant bacteria from industrial effluents, Amala-khadi-Ankleshwar, Gujarat. International Journal of Environmental Sciences 3: 5. 6. Pacyna JM, Pacyna EG (2001) An assessment of global and regional emissions of trace metals to the atmosphere from anthropogenic sources worldwide. Environmental Reviews 9: 269-298. 7. Czekalski N, Gascón Díez E, Bürgmann H (2014) Waste-water as a point source of antibiotic-resistance genes in the sediment of a freshwater lake. ISME J 8: 1381-1390. 8. Duruibe J, Ogwuegbu M, Egwurugwu J (2007) Heavy metal pollution and human biotoxic effects. 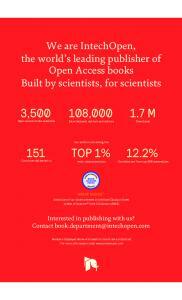 International Journal of Physical Sciences 2: 112-118. 9. Wang J, Chen C (2009) Biosorbents for heavy metals removal and their future. Biotechnol Adv 27: 195-226. 10. Gadd GM (2010) Metals, minerals and microbes: Geomicrobiology and bioremediation. Microbiology 156: 609-643. 11. Kumar R, Sharma AK, Singh P, Dhir B, Mehta D (2014) Potential of Some Fungal and Bacterial Species in Bioremediation of Heavy Metals. Journal of Nuclear Physics, Material Sciences, Radiation and Applications 1: 213-223. 12. Macek T, Mackova M (2011) Potential of biosorption technology Microbial Biosorption of Metals. Springer 7-17. 13. Shuhong Y, Meiping Z, Hong Y, Han W, Shan X, et al. (2014) Biosorption of Cu(2+), Pb(2+) and Cr(6+) by a novel exopolysaccharide from Arthrobacter ps5. Carbohydr Polym 101: 50-56. 14. Hrynkiewicz K, Baum C (2014) Application of microorganisms in bioremediation of environment from heavy metals Environmental Deterioration and Human Health. Springer 215-227. 15. Baker A, McGrath S, Reeves RD, Smith J (2000) Metal hyperaccumulator plants: A review of the ecology and physiology of a biological resource for phytoremediation of metal-polluted soils. Phytoremediation of contaminated soil and water 8: 85-107. 16. Chaney RL, Angle JS, Broadhurst CL, Peters CA, Tappero RV, et al (2007) Improved understanding of hyper-accumulation yields commercial phytoextraction and phytomining technologies. Journal of Environmental Quality 36: 1429-1443. 17. Macek T, Kotrba P, Svatos A, Novakova M, Demnerova K, et al. (2008) Novel roles for genetically modified plants in environmental protection. Trends Biotechnol 26: 146-152. 18. Muyzer G, Stams AJ (2008) The ecology and biotechnology of sulphatereducing bacteria. Nat Rev Microbiol 6: 441-454. 19. Singh S, Kang SH, Mulchandani A, Chen W (2008) Bioremediation: Environmental clean-up through pathway engineering. Curr Opin Biotechnol 19: 437-444. 20. Volesky B, May H, Holan ZR (1993) Cadmium biosorption by Saccharomyces cerevisiae. Biotechnol Bioeng 41: 826-829. 21. Yu FB, Shan SD, Luo LP, Guan LB, Qin H (2013) Isolation and characterization of a Sphingomonas sp. strain F-7 degrading fenvalerate and its use in bioremediation of contaminated soil. J Environ Sci Health B 48: 198-207. 22. Davis TA, Volesky B, Mucci A (2003) A review of the biochemistry of heavy metal biosorption by brown algae. Water Res 37: 4311-4330. 23. Neethu CS, Mujeeb Rahiman KM, Saramma AV, Mohamed Hatha AA (2015) Heavy-metal resistance in Gram-negative bacteria isolated from Kongsfjord, Arctic. Can J Microbiol 61: 429-435. 24. 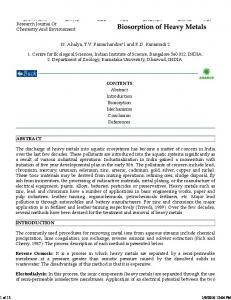 Ahalya N, Ramachandra T, Kanamadi R (2003) Biosorption of heavy metals. Res J Chem Environ 7: 71-79. 25. Sardrood BP, Goltapeh EM, Varma A (2013) An Introduction to Bioremediation Fungi as Bioremediators. Springer 3-27. 26. Leitão AL (2009) Potential of Penicillium species in the bioremediation field. Int J Environ Res Public Health 6: 1393-1417. 27. Li X, Li A, Long M, Tian X (2015) Equilibrium and kinetic studies of copper biosorption by dead Ceriporia lacerata biomass isolated from the litter of an invasive plant in China. J Environ Health Sci Eng 13: 37. 28. Cho DH, Kim EY, Hung YT (2010) Heavy metal removal by microbial biosorbents Environmental Bioengineering Springer 11: 375-402. 40. Li J, Lin Q, Zhang X (2010) Mechanism of electron transfer in the bioadsorption of hexavalent chromium within Leersia hexandra Swartz granules by X-ray photoelectron spectroscopy. J Hazard Mater 182: 598-602. 41. Celekli A, Yavuzatmaca M, Bozkurt H (2010) An eco-friendly process: predictive modelling of copper adsorption from aqueous solution on Spirulina platensis. J Hazard Mater 173: 123-129. 42. Zeng X, Wei S, Sun L, Jacques DA, Tang J, et al. (2015) Bioleaching of heavy metals from contaminated sediments by the Aspergillus niger strain SY1. Journal of Soils and Sediments 15: 1029-1038. 29. Lone MI, He ZL, Stoffella PJ, Yang XE (2008) Phytoremediation of heavy metal polluted soils and water: progresses and perspectives. J Zhejiang Univ Sci B 9: 210-220. 43. Dursun AY (2006) A comparative study on determination of the equilibrium, kinetic and thermodynamic parameters of biosorption of copper (II) and lead (II) ions onto pretreated< i> Aspergillus niger. Biochemical Engineering Journal 28: 187-195. 30. Green-Ruiz C, Rodriguez-Tirado V, Gomez-Gil B (2008) Cadmium and zinc removal from aqueous solutions by Bacillus jeotgali: pH, salinity and temperature effects. Bioresour Technol 99: 3864-3870. 44. Fan T, Liu Y, Feng B, Zeng G, Yang C, et al. (2008) Biosorption of cadmium(II), zinc(II) and lead(II) by Penicillium simplicissimum: Isotherms, kinetics and thermodynamics. J Hazard Mater 160: 655-661. 31. Lu WB, Shi JJ, Wang CH, Chang JS (2006) Biosorption of lead, copper and cadmium by an indigenous isolate Enterobacter sp. J1 possessing high heavymetal resistance. J Hazard Mater 134: 80-86. 45. Martins LR, Lyra FH, Rugani MM, Takahashi JA (2015) Bioremediation of Metallic Ions by Eight Penicillium Species. Journal of Environmental Engineering C4015007. 32. Hasan SH, Srivastava P (2009) Batch and continuous biosorption of Cu(2+) by immobilized biomass of Arthrobacter sp. J Environ Manage 90: 3313-3321. 46. Ghosh A, Ghosh Dastidar M, Sreekrishnan T (2015) Recent Advances in Bioremediation of Heavy Metals and Metal Complex Dyes: Review. Journal of Environmental Engineering C4015003. 33. Uzel A, Ozdemir G (2009) Metal biosorption capacity of the organic solvent tolerant Pseudomonas fluorescens TEM08. Bioresour Technol 100: 542-548. 34. Ziagova M, Dimitriadis G, Aslanidou D, Papaioannou X, Litopoulou Tzannetaki E, et al (2007) Comparative study of Cd (II) and Cr (VI) biosorption on< i> Staphylococcus xylosus and< i> Pseudomonas sp. in single and binary mixtures. Bioresource Technology 98: 2859-2865. 35. Quintelas C, Rocha Z, Silva B, Fonseca B, Figueiredo H, et al. (2009) Removal of Cd (II), Cr (VI), Fe (III) and Ni (II) from aqueous solutions by an< i> E. coli biofilm supported on kaolin. Chemical Engineering Journal 149: 319-324. 36. Gupta VK, Rastogi A (2008) Biosorption of lead from aqueous solutions by green algae Spirogyra species: kinetics and equilibrium studies. J Hazard Mater 152: 407-414. 37. Freitas OM, Martins RJ, Delerue-Matos CM, Boaventura RA (2008) Removal of Cd (II), Zn (II) and Pb (II) from aqueous solutions by brown marine macro algae: Kinetic modelling. J Hazard Mater 153: 493-501. 38. Bulgariu L, Lupea M, Bulgariu D, Rusu C, Macoveanu M (2013) Equilibrium study of Pb (II) and Cd (II) biosorption from aqueous solution on marine green algae biomass. 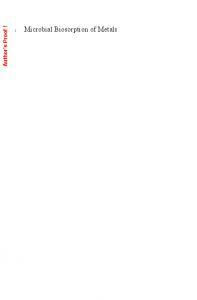 Environmental Engineering and Management Journal 12: 183-190. 39. Hajar M (2009) Biosorption of cadmium from aqueous solution using dead biomass of brown alga Sargassum Sp. Chemical Engineering Transactions 17: 1173-1178. 47. Ozer A, Ozer D (2003) Comparative study of the biosorption of Pb(II), Ni(II) and Cr(VI) ions onto S. cerevisiae: determination of biosorption heats. J Hazard Mater 100: 219-229. 48. Kumar R (2014) Potential of Some Fungal and Bacterial Species in Bioremediation of Heavy Metals. Journal of Nuclear Physics, Material Sciences, Radiation and Applications 1: 213-223. 49. Tan TW, Hu B, Su H (2004) Adsorption of Ni< sup> 2+ on amine-modified mycelium of< i> Penicillium chrysogenum. Enzyme and microbial technology 35: 508-513. 50. Infante J, De Arco R, Angulo M (2014) Removal of lead, mercury and nickel using the yeast Saccharomyces cerevisiae. Revista MVZ CÃ³rdoba 19: 41414149. 51. Katsumata H, Kaneco S, Inomata K, Itoh K, Funasaka K, et al. (2003) Removal of heavy metals in rinsing wastewater from plating factory by adsorption with economical viable materials. J Environ Manage 69: 187-191. 52. Tian J, Peng XW, Li X, Sun YJ, Feng HM, et al. (2014) Isolation and characterization of two bacteria with heavy metal resistance and phosphate solubilizing capability. Huan Jing Ke Xue 35: 2334-2340. 53. Wang LK, Hung YT, Shammas NK (2007) Advanced physicochemical treatment technologies: Springer 5: 174-175. 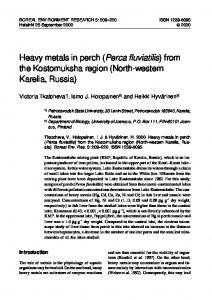 Report "Microorganisms and Biosorption of Heavy Metals in the Environment ..."